Shortly before 2100 EDT on Friday 13 April, President Trump addressed the nation live on TV from the White House, confirming his decision to go ahead with conducting airstrikes on precision targets in Syria. During his speech he stated "The purpose of our actions tonight is to establish a strong deterrent against the production, spread, and use of chemical weapons.” Within minutes of the address, reports began emerging of explosions in Damascus and Homs. The operation continued for approximately 70 minutes during which a claimed payload of in excess of 100 missiles was delivered onto strategically targeted locations with surgical precision. Airstrikes were carried out using a mix of land and sea based military hardware operated by the US, UK and France and launched from platforms in the Eastern Mediterranean, Red Sea, France and possibly Qatar according to international press reports. President Putin gave a press conference on Saturday 14 April during which he condemned the “attack on Syria in the most serious way" and said Russia would call for an urgent UN meeting. In a statement carried on Russian state TV, Mr Putin said striking Syria was an "act of aggression", adding the suspected chemical weapons attack in the town of Douma last week had been staged and used as a pretext for the attack. Earlier on Saturday morning Russia's Defence Ministry said the majority of missiles fired during the attack were intercepted by Syrian air defence systems using Soviet-produced hardware, including the Buk missile system. However, Anatoly Antonov, the Russian ambassador to the US, warned that in spite of the limited claimed impact of the airstrikes, “such actions will not be left without consequences” adding Moscow was being threatened. Iran, a major supporter of the Bashar al-Assad regime, has joined Russia in condemning what it described as “ the blatant violation of international laws, as well as ignoring the sovereignty and territorial integrity of Syria," according to an Iranian Foreign Ministry spokesman. The state-run Syrian Arab News Agency (SANA) also reported Syria’s Foreign Ministry as stating joint US, UK and French airstrikes were a "flagrant violation of international law and the principals of UN charter," adding “Syria calls on the international community to strongly condemn this aggression, which will lead to nothing but the igniting of tensions around the world and pose a threat to international peace and security as a whole”. Despite the warnings and rhetoric coming out of Moscow and Tehran, there have been no signs of any retaliatory measures as yet. It is thought the US specifically identified targets to mitigate the risk of Russian forces being involved and that Russia may have been tipped off ahead of the airstrikes. Indeed, the Russian state news agency TASS reported that “none of the launched missiles entered the zone of responsibility of Russian Federation air defence units, protecting facilities in Tartus (naval base) and Hmeymim (air base). This indicates confirmation that the airstrikes appear to have been designed as a carefully measured response to the alleged use of chemical weapons by Syrian forces; without provoking tensions with Russia to a point of no return. The situation remains fluid and the next 24-48 hours are critical. The airstrikes appear to have been a single operation, and in fact US defence officials confirmed early Saturday that “this wave of airstrikes is over." However, this was also caveated with the warning that they are prepared for a sustained campaign until the Syrian regime ceases its alleged use of chemical weapons. In terms of impact across the region, the fallout from the airstrikes appears limited. In the immediate hours following the airstrikes, as expected it was concerns over commercial airspace safety which first emerged as the FAA issued another Notice to Airmen (NOTAM) regarding risk to aircraft operating within 200 nautical miles of the Damascus flight information region (FIR). This is a significant area covering over 300 kilometres and could potentially mean re-routing or service disruption for aircraft operating into and out of Israel, Jordan, Lebanon, Iraq and Cyprus. A previous rapid alert notification from the European Aviation Safety Agency to its operations portal issued on 11 April, warned of the possibility of missile activity in the ‘Eastern Mediterranean/Nicosia FIR’ and intermittent disruption to radio navigation equipment within 72 hours of publication. Subsequently Kuwait Airways announced it will cancel flights between Kuwait and Beirut from 12 April onward, until further notice, due to security warnings. Middle East Airlines, based in Beirut, announced it will reroute and retime certain flights due to the “recent security situation between US and Syria”. 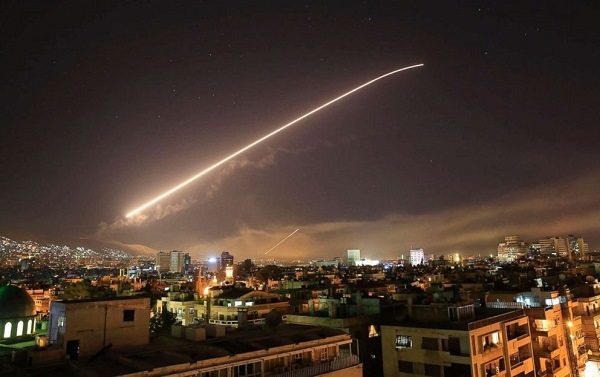 Saturday’s airstrikes by the US, UK and France are the biggest military Western intervention into Syria’s seven year civil war and they are certain to raise new questions about President Trump’s Middle East strategy and what the next moves will be. However, it seems highly unlikely the US would want to commit to an indefinite presence in Syria, and this is indicative of the measured, surgical, nature of the targeting of today’s airstrikes; seemingly in response to the alleged chemical weapons attack in Dhouma, rather than a wider move to commit increased military resources to the area.